Cough syrup, antibiotic medicine, cod-liver oil and tonic water are some of the medicines and pick-me-ups that may have been found in these bottles at one time. 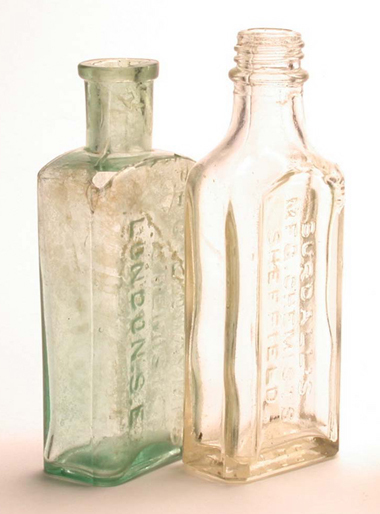 These two glass bottles come from chemists' shops and once contained medicines for the patient to drink. The bottles are made of clear moulded glass. They were produced in a factory - molten glass was poured into the moulds to make the bottles' shape. The moulds had the chemists' names carved in them so that the names stood out from the finished bottles. Moulded bottles started being made in the 1830s and were available throughout the Victorian era and into the 20th century. The main difference between the two bottles is that they had different lids. This shows that they were made at different times. Galloway Chemist's bottle has a smooth neck and a cork stopper sealed it. Corks were used to seal glass bottles until the 1930s, so this bottle was made before 1930. Burdall's Chemist's bottle has a screwtop neck, and so it was made after 1930. Originally, these bottles had labels and were probably packaged in individual boxes. But the packaging has since been lost or washed off, so the medicine they contained is unknown. These bottles hold about 21/2 fluid ounces (75 millilitres) of liquid. Medicine doses were often marked on a paper strip. This label was cut and pasted on the back of the bottle to show the level of the doses. People usually measured their doses using a teaspoon, dessert spoon and tablespoon. Packaging has always been important in making brand medicines attractive and recognisable. Makers often designed special bottles in particular shapes and colours, with eye-catching labels. Moulded bottles with the chemist's name embossed on the glass made the medicine stand out. It also stopped rivals producing imitations of the bottles. Customers knew what to look for in the 'genuine' article and weren't fooled by imitations. Glass medicine bottles date from the end of the 16th century. Glass is ideal for holding medicine because it does not react with the chemicals. Early bottles were small, dark-green or bluey-green in colour. They were made for individual doses so that if a person needed six doses they then needed to buy six bottles. Then in the 19th century medicines began to be given in larger, more convenient bottles that took account of the need for several doses of a medicine to fight off illness. Doctors commonly prescribed multi-dose mixtures after 1850. In the Victorian pharmacy, prescription medicines were made up in the shop and put into bottles. The chemist measured the ingredients. Then he added the powders to water or alcohol to make a liquid medicine. When an ingredient didn't dissolve easily, a thickening agent was added to hold the heavy powder. Preservatives and flavourings were added to the mixture. Finally the chemist put the mixture into a bottle. The Victorian chemist kept a large stock of bottles to give to customers. The typical Victorian bottle of prescription medicine often contained chloral, quinine or bromide to treat different illnesses. Opium was prescribed treatment for insomnia and fevers. Cod-liver oil was a common remedy for a variety of ills. Tuberculosis was the century's leading killer and the recommended medicines ranged from herbs, animal products to chemicals of all kinds - including mercury, gold salts and creosote! Chemists often made their own medicines. These were known as 'patent' medicines. They could be bought without a prescription and were easily available 'over the counter'. Chemists produced these medicines at the back of their shops and in factories. There weren't any controls on brand medicines. They were made from a 'secret formula' and chemists claimed that they cured many ills and guaranteed good health. In reality the medicines would contain alcohol or opiates. These ingredients probably relieved pain and made the patient feel better, but it is unlikely that brandy or opium would have cured anybody! At the end of the Victorian era, more effective medicines were discovered, such as the first antibiotics. Medicines began to be factory produced, and the bottles arrived at chemists' shops ready for dispensing to customers. But making up liquid prescription medicines by hand continued for a long time into the 20th century. This makes it difficult to date these bottles or work out what they contained.